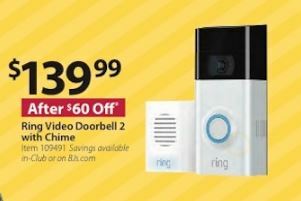 Find the best deals on Ring video doorbells and home security cameras during Black Friday 2018. 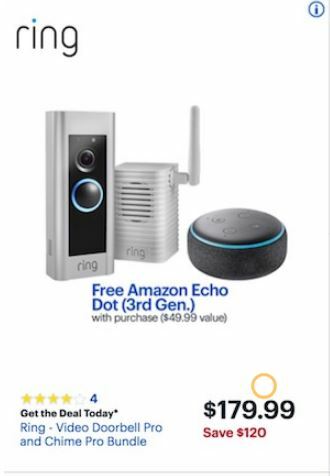 Funtober tracks all of the biggest sales and price discounts on Ring smart home devices from Thanksgiving Day to Cyber Monday 2018 at major retailers and online websites such as Amazon and Best Buy. 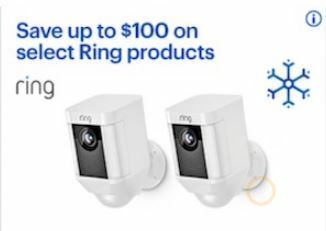 Ring Alarm: A home security system that is completely customizable and easy to install. Connects to the Ring app, so you always know what is happening in your home. Professional monitoring 24/7 with cellular backup is only $10 a month. Stick Up Cam: Indoor/outdoor security camera with flexible mounting options that can be powered by solar power, battery, or PoE. 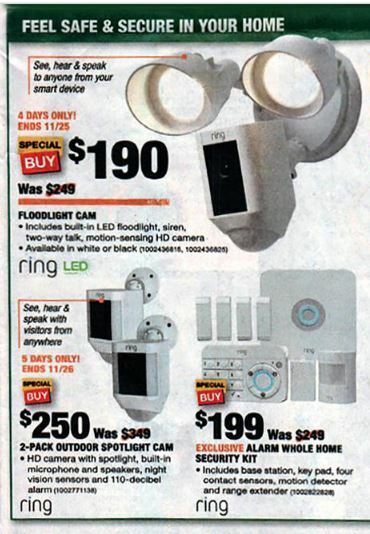 Spotlight Cam: Choose between a battery-powered security camera with LED spotlights and siren, a plug-in wired camera, an HD camera with two-way talk connected to a Solar Panel or a hardwired security camera. Average install time between 5-25 minutes. 1080 HD video resolution. 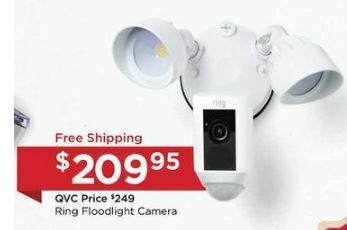 Floodlight Cam: Hardwired security camera with ultra-bright LED floodlights and siren. Video Doorbell: Elite is a professional-grade doorbell with flush-mount and PoE. Pro is a hardwired doorbell with sleek design and advanced security features. the Video Doorbell 2 is the next generation doorbell with quick-release battery and enhanced video. 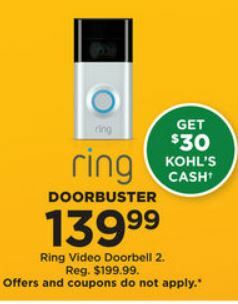 The first generation Video Doorbell is priced at just $99.99. 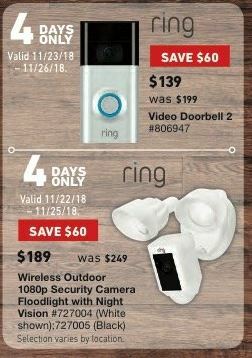 Ring Black Friday Deals: We will post all of the best sales on Ring cameras during Thanksgiving 2018. Ring Cyber Monday Deals: Find the biggest online price discounts on the Monday after Thanksgiving on these smart home technology products.